In an exciting first quarter of 2019, our café at African Relish is finally up and running. We’ve been busy. Starting with a limited menu of pizzas and pastas, we are gradually expanding the menu. Chef’s Café is everything we hoped, providing an easy family eatery for visitors. Perhaps more important, it offers a full-spectrum of hospitality service experience for our team. With a menu developed by Chef Camilla Comins, based on local, seasonal produce and the AR team’s skill set, the café operates independently from the school. This means that functions and cooking school activities don’t conflict with trading times in the café. Shane Jacobs has made great strides since he joined the AR kitchen team. Camilla has however had to give up her protegé in this process. 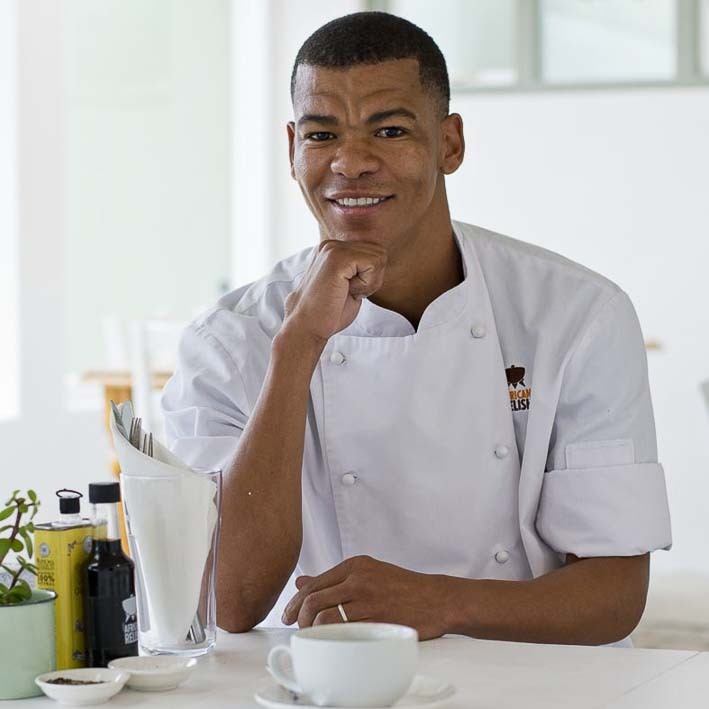 Shane Jacobs joined us as a student enrolled in the Networx Tourism Ambassador programme almost two years ago. During a couple of internal kitchen training exercises, he showed an aptitude for cooking. Camilla took him under her wing and has been mentoring him for the past year. He’s shown such promise that he now runs the café kitchen. 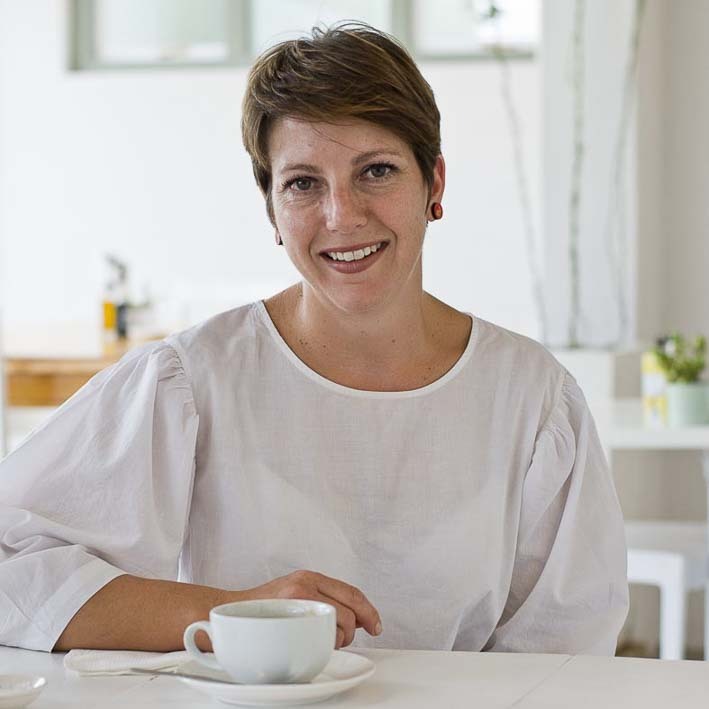 Working with him, running the wood-fired oven is Charlotte van der Westhuizen who bakes pizzas to perfection. Bronwyn Delport assembles pizzas to order and handles other cold kitchen tasks. Front-of-house is run by Mietjie Leonards and Bianca Hinkman, and they are backed on the admin and systems side by Henzil Ceylon. Add Sarah Lottering running the scullery, and we have a fabulous team in the café. We are very proud to say they are a totally local, Prince Albert team. Trained entirely through programmes at African Relish, they’ve achieved miracles in a few short months. 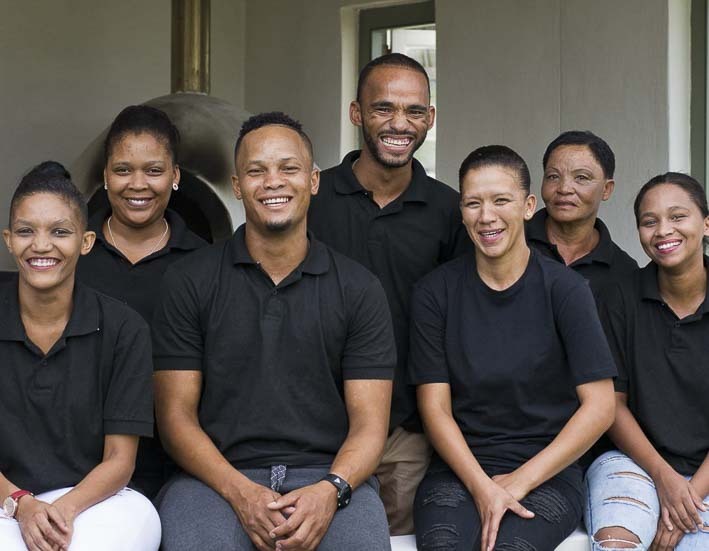 The Chef’s Café team is, L to R: Charlotte, Mietjie, Shane, Henzil, Bronwyn, Tannie Sarah and Bianca. While the café hits its stride, we are also building up a retail deli offering at African Relish. The shelves are being stocked with locally sourced produce and a carefully curated selection of other foodie products. The deli will trade the same hours as the Café, open until 21H00, Tuesday to Saturday. 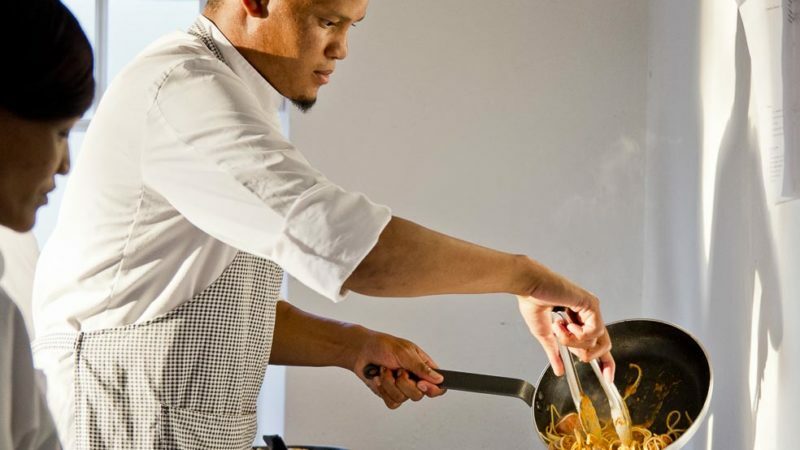 With ready-meals and grocery items to fix an impromptu meal, we aim to be a go-to solution for late arrivals at guesthouses and self-catering venues in town. A lot is happening with the core African Relish team too. 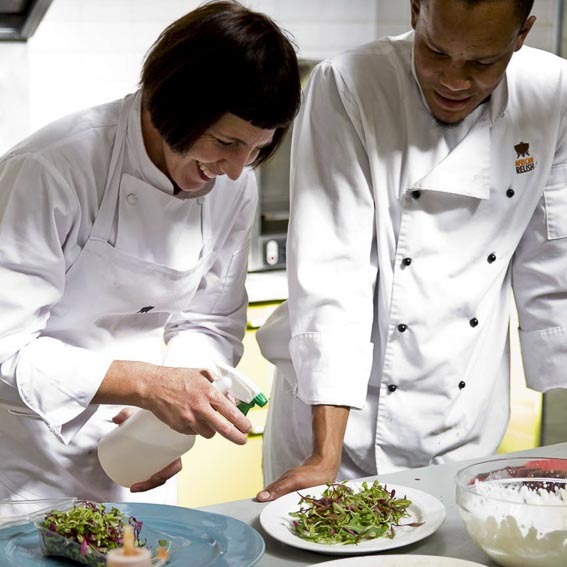 Chef Camilla has taken a sort of sabbatical, and is working a couple of days a week on a short-term contract with a major food retailer in Cape Town. A fresh perspective is already paying dividends in our kitchen as she brings back new ideas and inspiration weekly. Hendry Olivier is filling the gap teaching classes in the early part of the week. His unique approach to teaching is drawing great compliments and admiration from our guest. Hendry is also there to back Camilla up as we navigate a very busy season of functions and weddings. In the midst of this, we are very sorry to see Virna leave the permanent team to join her husband in Hermanus. Shaun van der Walt received a wonderful promotion in the schools system which necessitated the move. Virna will continue to manage certain aspects of the African Relish experience from the Cape Town office while Michelle Lottering steps into the daily administrative role in Prince Albert. With a family background in the hospitality industry and an impressive CV including time with the Carluccio’s group of restaurants in London, Michelle brings strong managerial and systems knowledge to the team. Michelle Lottering brings a strong hospitality background to daily operations for AR. Acknowledging the huge role that Virna has played in making African Relish the business that it is, we are grateful to be able to count on her help going forward. Thanks to digital business assets such as the Cloud, her skills can be applied to assisting Michelle and growing the flow of visitors to Prince Albert.